So I was working with a customer who needed, among other things a friendly and secure telephone directory. The customer would publish a pocket sized paper pamphlet every year. Paper? Really? There must be a better way. Nobody wants to download an app (from Google Play or iTunes). No way, no how. Users really don’t want another login / password for yet another system. 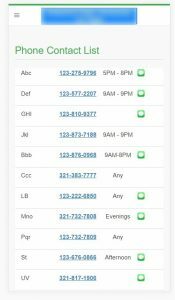 Who wants to update a phone directory every time someone joins or exits the group. Not I, said your software developer. We want a system that is easy to update, easy to maintain. If we are talking about members telephone numbers and contact information, secure, protected access is a critical requirement. Just about everyone has access to a mobile phone. Let’s take advantage of that. I had done a project using Google Apps Script and Google sheets as a data storage medium. There were some issues there.. the script ran in the browser which required an publicly shared Google sheet. Cool idea, if the use case fit that situation. 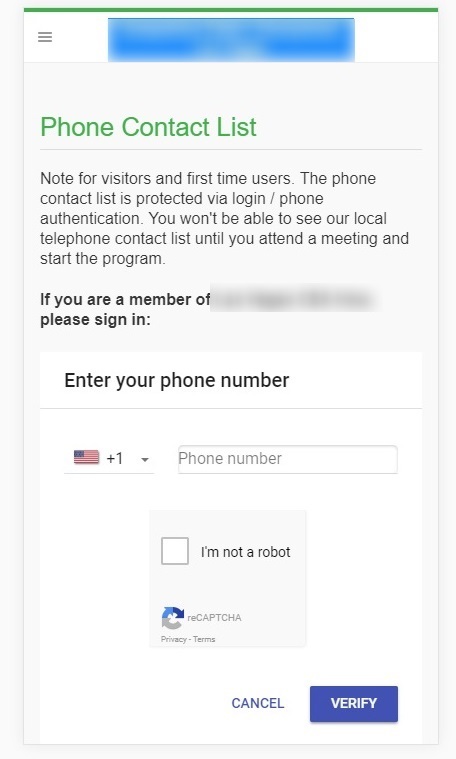 Great for product listings, not great for personal data. The available tools include Cloud data storage, data synch services, messaging delivery services, analytics, marketing tools and the thing I’m interested in, Authentication. The pricing for the phone authentication service free tier is pretty awesome: 10,000 / requests free per month. The whole thing works via JSON Web Tokens. JSON Web Token (JWT) is an open standard (RFC 7519) that defines a compact and self-contained way for securely transmitting information between parties as a JSON object. This information can be verified and trusted because it is digitally signed. JWTs can be signed using a secret (with the HMAC algorithm) or a public/private key pair using RSA. Do note, this isn’t a perfect high security system. Tokens are stored in browser cache. Anybody who shares phones is sharing the browser content. Its a lightweight security system, but probably appropriate for current usage, a phone directory or secure reference content for a small business’ employees. Content is stored in a private shared Google sheet. 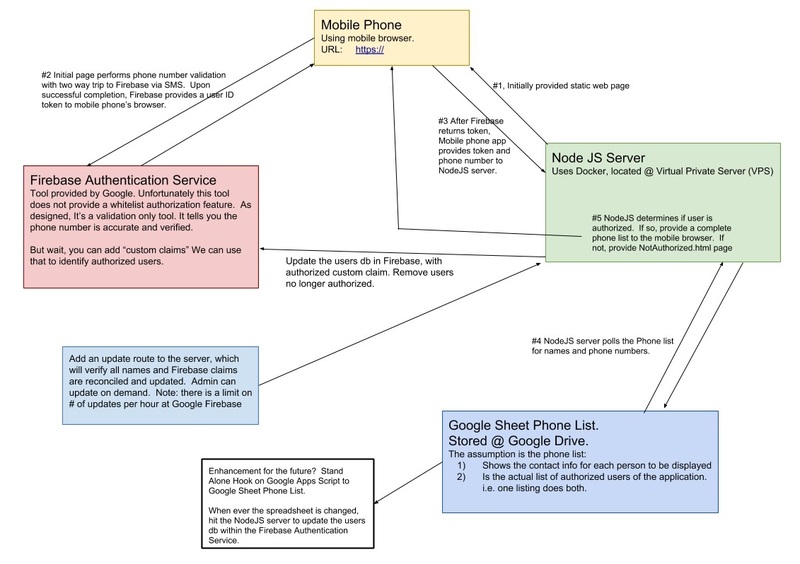 We use Google Apps Script, and the Sheet API v4 to gain server access to the user data. Again, we’re obtaining this info from the node.js server, not from the browser. What really makes this nice is non-technical folks can easily keep the data updated via Google Drive. The data can be easily updated from a mobile phone to add new users. Although I haven’t analysed all the how-to details, it should be possible to send out notifications to all users in the system via SMS messages. I can see where this could be very helpful. Another possible enhancement, more oriented to reference data, is using Progressive Web Apps to control the storage of protected data in cache. I have one customer possible application for this technology, where users are sometimes not located in an area with mobile phone reception. The tools available from Google are pretty awesome. Firebase can be used to supplement a whole lot of applications. In this case we are using the mobile phone authentication tools to authenticate and restrict data access to a small group of users. Google Apps Script, the support tools for Google Drive applications (including Google Sheets, online spreadsheets) is way helpful for prototyping applications, or applications where non-technical folks can keep private data easily updated.